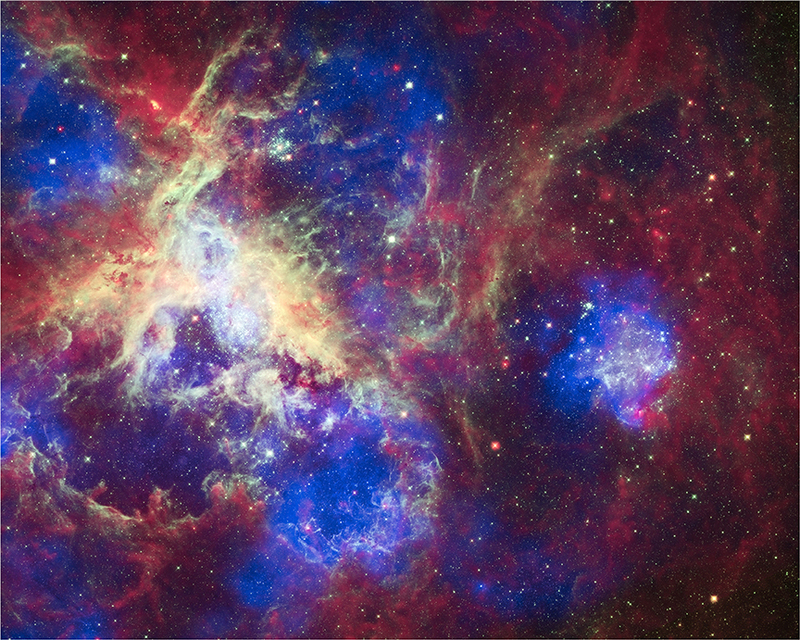 A new composite of 30 Doradus (aka, the Tarantula Nebula) contains data from Chandra (blue), Hubble (green), and Spitzer (red). 30 Doradus is one of the largest star-forming regions located close to the Milky Way. This region contains thousands of young massive stars, making it an excellent place to study how stars are born. To celebrate its 22nd anniversary in orbit, the Hubble Space Telescope has released a dramatic new image of the star-forming region 30 Doradus, also known as the Tarantula Nebula because its glowing filaments resemble spider legs. A new image from all three of NASA's Great Observatories - Chandra, Hubble, and Spitzer - has also been created to mark the event. 30 Doradus is located in the neighboring galaxy called the Large Magellanic Cloud, and is one of the largest star-forming regions located close to the Milky Way . At the center of 30 Doradus, thousands of massive stars are blowing off material and producing intense radiation along with powerful winds. The Chandra X-ray Observatory detects gas that has been heated to millions of degrees by these stellar winds and also by supernova explosions. 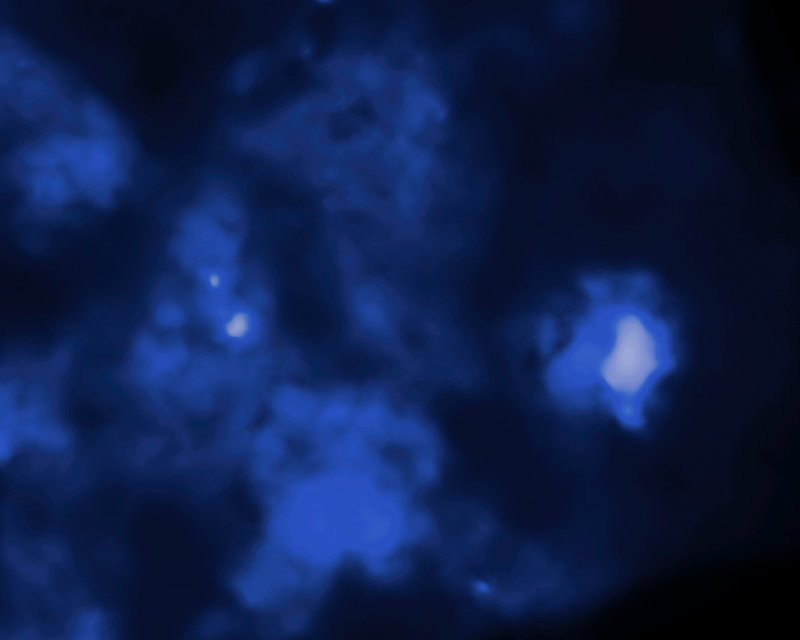 These X-rays, colored blue in this composite image, come from shock fronts -- similar to sonic booms -- formed by this high-energy stellar activity. The Hubble data in the composite image, colored green, reveals the light from these massive stars along with different stages of star birth including embryonic stars a few thousand years old still wrapped in cocoons of dark gas. Infrared emission from Spitzer, seen in red, shows cooler gas and dust that have giant bubbles carved into them. These bubbles are sculpted by the same searing radiation and strong winds that comes from the massive stars at the center of 30 Doradus. Credit X-ray: NASA/CXC/PSU/L.Townsley et al. ; Optical: NASA/STScI; Infrared: NASA/JPL/PSU/L.Townsley et al. Observation Time 31 hours 40 min. It looks like a mini version of what the big bang may have looked like. It is so beautiful. I often wonder who is looking back at us and wondering .. Thanks to everyone involved in getting these images out to the public. When I first looked at the Tarantula Nebula image I enlarged it on my screen and sat back and thought what an incredible universe it is. I don't know why, but a tear came to my eye as I let my mind try and wrap itself around space and life. Sounds silly, but I just wanted to convey the way this image affected me. Beautiful and once again, thank you! I have been studying Astor physics since retiring a few years ago and the pics and info I get from NASA are fantastic. Breathtakingly BEAUTIFUL! When the astronomy and astrophysics community work together, beauty is the result. If only the rest of humanity were on board... Thank You all for all the hard work you do. Fantastic! So amazing! I absolutely LOVE astronomy!!! This is so amazing, I can not wait to see more & more, deeper & deeper into space & all that it offers us to learn. I have been studying Astor physics since retiring a few years ago and the pics and info i get from NASA is fantastic. Absolutely gorgeous! And we are part of that!! This image is fantastic, and more amazing what it`s happening over there. X-rays from Chandra X-ray Observatory, Optical from Hubble Space Telescope and infrared observations from Spitzer. X-rays are blue, optical green and the infrared red.